As we approach the day when the veil between worlds is thinnest, I have been called to provide labyrinths in some of the inbetween places for those who wish to walk them. In some traditions, Samhain and not the end of Decmber would mark the end of the year, and I find that personally the symbology of that feels right. What better time to end a year than on a day meant for the dead, the spirits, and the uncanny things? In light of that, for as long as it lasts, there is a labyrinth on the beach at Evergreen State College, and as of last night, one on the beach at Carkeek at well. 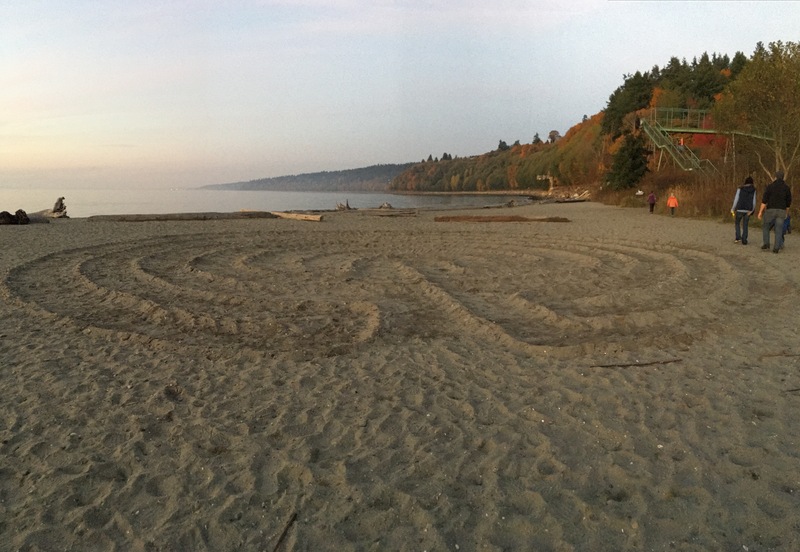 If you’re in the area, come join us at Golden Gardens on Wednesday, Nov. 1st to welcome the new year with a labyrinth there. If you bring clean dry firewood we can try to snag a fire pit and build a bonfire. We’ll get started around 4:30 or so, and if there’s enough people I’ll try laying out one with wider paths so its easier for multiple people to walk at once. If you’ve never walked a labyrinth before, it is a profoundly beautiful way to meditate and find your center, as it mimics the way life’s journey will circle around taking you past places you’ve walked before. Be good to each other, and remember those who have gone before in the long dark night. This is profound… I really wish I was there! Well done, young lady… proud to be your Mom!